Giveaway: Counting Birds Print 18x24. Your choice of color. Either Pink or green. Shown Below. Robin Rosenthal is a graphic designer and illustrator, and specializes in designing and developing products for babies and children. Her clients include Johnson & Johnson, and Sesame Workshop. She was also an art director for Martha Stewart Kids Magazine (how cool), where she realized how much she loved designing and illustrating for children and their parents. While at Martha Stewart she realized that there were limited options for artwork for kids' rooms that were modern, graphic, affordable, and fun. So she decided to design her own. You can check out her Alpha Dot and Counting Birds Poster here. CJane will also recieve her choice of the Counting Birds Posters. Do you think she will have a need for the pink one? Leave a comment telling me which poster you adore. Alpha Dot, or Counting Birds. Definitely the Counting Birds. LOVE. Green birdies for my little one. I love the green birdies and it would match my bird themed nursery perfectly!!! I like the Counting Birds in green. me too for the Counting Birds in green. Thank you FV! The Counting Birds in green! I love them both but I think I love the pink counting birds the most. oh yes, the counting birds. 2 years ago i would have never said this - i was not a fan of birds. but now that my 6 year old is sweetly obsessed with birds, birds will be forever endeared to me now. The counting birds in green would look great in my sons room. I love counting birds in pink...would be lovely in our girls' playroom!! I like the counting birds, so sweet! The cute little counting birds in green would be perfect in my baby's room! I would love counting birds--so adorable! Green Birdies is the cutest!! Green counting birds is adorable! LOVE the counting birds in green! So sweet! Love the counting birds in green! those green counting birds are super cute - my 2 year old just spotted them and started "counting" them! :)! I love the counting birds! i LOVE, LOVE, LOVE the counting birds, in pink of course. i love anything with birdies... my most fav decor 'theme'!!! :) it would look adorable in my baby girl's nursery! Love the counting Green birdies! live the green birdies! so cute! I love the counting birds in pink! I like the counting birds in Green! Love counting birds- in pink from my sweet little babe! I adore the green counting birds!!!! 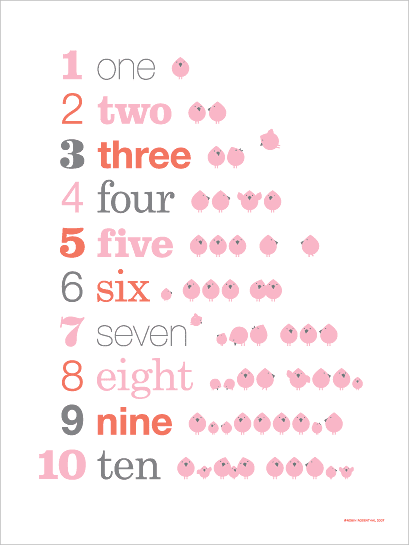 The pink birds counting poster is just adorable! It would look so cute in my daughter's bedroom! The green counting birds are just too adorable. I love it. I love the green counting birds! oh yes, the counting birds are so, so lovely! I would definitely pick the pink counting birds. So cute! I love the green counting birds. Matches my nursery too! I LOVE the pink and grey counting birds! i have girls, but i love the green counting birds. I would love the green counting birds for my boys' room. Such an adorable print! I love the green counting birds. Joseph and I would count them every day! Because I'm determined that my son NEEDS the green counting birds, I would like you to know that I follow FV for an extra entry! One more extra entry - I've subscribed to the FV RSS. Please pick me! Oh, the Counting Birds are adorable! I am subscribed to FV RSS feed. i love the green counting birds. The counting birds in pink is perfect for my girls' bedroom! counting birds is really fun. I looove the green counting birds. My 2 year old is just learning to count and would love that! Green Counting birds is so cute! I love both. But my girls know how to count now its time to teach them letters. I know a little girl who needs the counting birds. counting birds is my fav! So loving the green counting birds. So adorable! Love the green counting birds! The green counting birds are adorable! Definitely the counting birds in Green!! The Pink counting birds is so cute. I have to have it. Green counting birds is cute! I'm a new follower to your blog...and I pretty much love you! I would LOVE to win the pink counting birds print...ADORABLE! 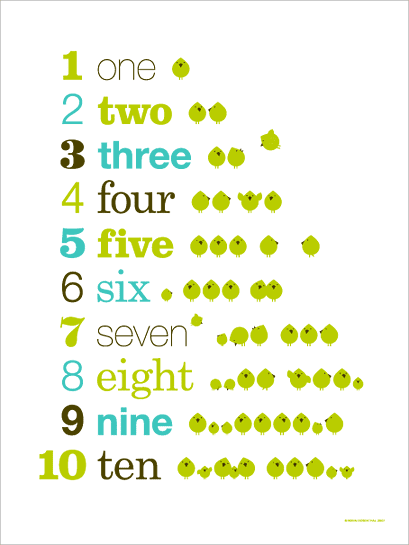 Green counting birds...it would look great in my nursery! Counting birds in either color - right now we don't have any use for pink (but I would happily stash it away for the future). Pink counting birds for my little girlie! counting birds in either color! Counting birds in Green! Love it. The counting birds in green - so cute! love the counting birds in green! Adorable! I would be a proud owner of the pink one. love the green counting birds. Ooohhh the alphadot is beautiful too! I love the pink counting birds! That would be so fun in my daughters room! Love the green counting birds!! I like the birdies best too! Wanting the counting birds. So adorable! And would be so perfect in son's nursery. I love the green counting birds, no pink for me, but hoping Cjane needs it. i love the simplicity of the alphadot. the green print would be perfect in our playroom!! Counting birds in green for sure! I love the counting birds in green! How cute are those green counting birds! The counting birds are DARLING!!! Pink for my girls and green for my boys. Counting Birds in PINK ... must have for my daughter's room!!! Counting birds in green. Thank you! Counting birds are too cute! Green Counting birds! That would be so cute in my nursery. I love the he counting birds! Definitely the Counting Birds in Green. the pink counting birds! following FV! I like the alpha dot poster. Simple and sweet. love counting birds in green and blue. The alpha poster is so cute, and I would pick the green birds! Loving the green birdys!!!! so sweet- and would match my nursery PERFECTLY!!!! oh pick me!!! 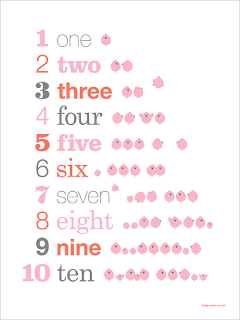 The counting birds in pink would be cute in my daughter's room! Green birds for my little. Oh I love the counting birds in green and blue! That is so precious. Counting birds in green please!! I love the counting birds! lovely!! Counting birds in pink is, for sure, my favorite. i love birds!! in green, no less! I love counting birds in green! I love the pink birds. It would go great in my daughter's room.